Today I received a surprise call from my Broadband provider, Tata Indicom. The person on the other end talked about their new Fair Usage Policy for those who have unlimited plans. The details of this policy are given here. The Indicom guy said that it was forced by the government (a lie!!). I have an unlimited 384Kbps plan, now according to this policy I can not upload+download more than 70GB (limitation!). I wonder if both speed and data transfer are restricted, why they call it an unlimited plan. On asking the same question from the Indicom guy, he said that this policy enables other users to use the Internet fairly (I use it unfairly!). I have around 200GB in the downloading queue and with these restrictions in the place it will take around 4 months to download (not to forget the downtime and power cuts!). I can not get rid of Tata Indicom because Airtel does not cover my area (heard they also have similar policy! 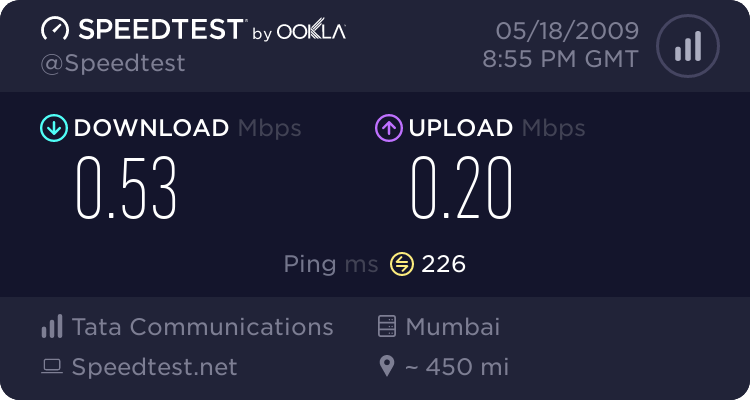 ), Reliance broadband is worse than Indicom, BSNL guys are deaf and they don't really care about a thing in the world (govt employees!). Other option, USB Modems is another nightmare, never heard a good thing about them. Only BSNLs EVDO is good (based on rumours!) but again its availability and support is NIL in the Indian IT Hub. To be frank, India (a third world country!!) is still far behing in this field, we pay huge amounts to get nothing but headache in the name of broadband. Lets pray that one day after hundred years we'll get an unlimited 32 Mbps connection. And I pay 1100+ Rs. for this, which works 15 days a month and 15 hrs in a day.